Baby Girl will sneak in there & get into my makeup! Her favorite thing to do is use my mascara as "sip-stick" (lipstick). How cute is she!! She will really laugh about what she used to do when she looks at these in a few years!!! I remember doing that when I was little! I love my mom's makeup! That is so funny! She is such a cutie! The photo is cute but her saying "sip-stick" is the best! I know it's a mess for you, but we get to just sit back and enjoy it. And I sure did! Isn't that fun to clean up! 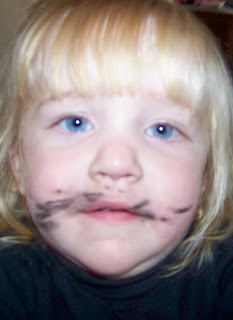 I never have figured out why children are so into makeup. The worst makeup disaster I have ever seen was my little brother in the corner with bright red lipstick everywhere on himself, the wall, and the carpet. It took my mom about five minutes to realize he wasn't bleeding to death. By that time she was so glad he wasn't bleeding that she didn't even punish him!! I have a photo exactly like this, only she's got it on her entire body! Too cute.